French born German pianist and composer. Photograph Signed, inscribed and dated "To P.D. Hinder with best wishes, Yours truly, Walter Gieseking. Febr. 1936". Approx 5.75 x 4 inches (14.5 x 10 cms). In fine condition. 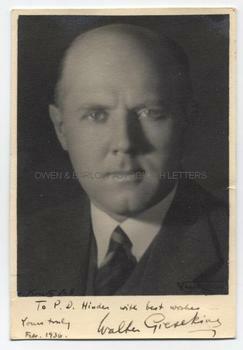 Walter Gieseking is shown head and shoulders with his gaze fixed directly on the camera.